Designed to securely store your passwords in one centralized location. 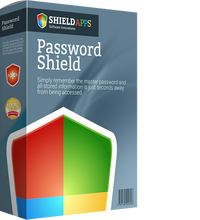 Password Shield Pro 1.8.4 was available as a giveaway on May 2, 2017! 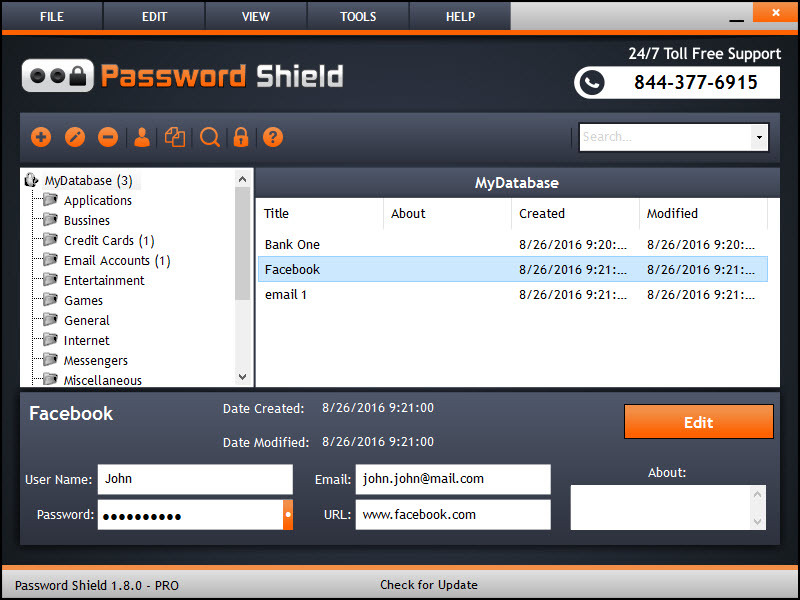 Password Shield is designed to securely store your passwords in one centralized location. Simply remember the master password and all stored information is just seconds away from being accessed. Password Shield organizes passwords by category for you and is easily configurable and customizable, allowing you full flexibility in managing your user name/ passwords records. 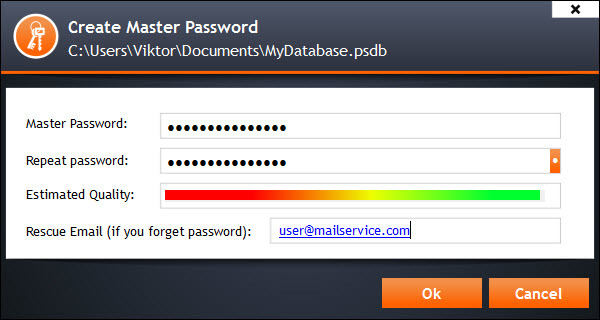 Password Shield setup is simple and only requires the creation of a master password and email address (in case the master password is forgotten). 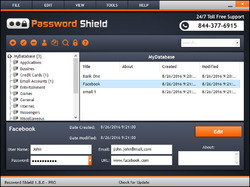 Password Shield is a time saving solution that stores all passwords in one place. No more wasted remembering where you wrote down your passwords. With Password Shield you’ll never lose a password again! How would you improve Password Shield Pro 1.8.4? Shield Antivirus combines advanced antivirus and anti-spyware technologies to provide complete security and privacy! Shield Antivirus offers protection from all to-date viruses, trojans, and spyware. It offers active protection from threats and is set to monitor, block, and alert whenever a threat is detected. Shield Antivirus also offers email protection by blocking and quarantining any threats located in incoming emails. The app includes extra tools, such as secure file eraser, history cleaner, and start-up manager to help keep your computer protected and operating at peak performance. It's definitely a good idea to have a password manager if for no other reason than to have different passwords for everywhere you go on the internet. We've been happy overall with LastPass, but even that one has some annoying quirks. I would recommend Sticky Password, which was given away last week. You have the option to store in the cloud or locally on a hard drive or thumb drive. Can synchronize with other computers and cell phones. Been using it for years and the company is responsive to queries for help. I followed the download link and install ed the software but it appears as trial version.Would you please help me with this issue? "....Password Shield setup is simple and only requires the creation of a master password and email address (in case the master password is forgotten)...."
So, they have a master password record of your master passwords, hmmmm, and they can send you the master password via e-mail, hmmmm again, not for me. Company states: "....Password Shield setup is simple and only requires the creation of a master password and email address (in case the master password is forgotten)...." So, they have a master password record of your master passwords, hmmmm, and they can send you the master password via e-mail, hmmmm again, not for me. Freddy, Yep,, hardly peace of mind.. a piece of paper would be more centralized AND secure. Freddy, The requirement for the email is for contacting/verifying it's you so you can reset your master password to a new one-not so they can send it to you. I'm surprised none of your "up-votes" know that. Does this program automatically sign you in when you are on a webpage or do you still need to copy and paste? I know I could try this program and find out for myself, but I hope someone might have the answer before I do. The last password program I installed from here was just a password storage and if I wanted that I already have a file in Word that does it. Is this useable for only 1 year? After which the give away suddenly stops working? Where is this "one space" that the software stores the passwords? Is it on your own PC hard disk or somewhere in the Cloud? The company website is ambiguous on this. It refuses to explain clearly. Why is it hiding this detail? Beware of the Lock Workspace option. If you are not careful and do not remember your password for this, you cannot use your PC. Is this useable for only 1 year? After which the give away suddenly stops working? Where is this "one space" that the software stores the passwords? Is it on your own PC hard disk or somewhere in the Cloud? The company website is ambiguous on this. It refuses to explain clearly. Why is it hiding this detail? Beware of the Lock Workspace option. If you are not careful and do not remember your password for this, you cannot use your PC. What if someone uses multiple computers, there seems to be no way to sync them together? I would suggest having an encrypted database file saved and read from something like dropbox, which has the ability to sync files across multiple computers. If you are going to use program of this type in Windows make sure where you enter the master password is as secure as possible. Use an anti-keylogger, project the clipboard etc. Good information and free programs will help you with the above are available at the following link. Rapport is recommended by many banks and is the one I use when I view my bank statement details. Note I said view, I never do any transaction in Windows as I consider it too insecure. I never use password managers but if I did I would only do it in conjunction with an anti- keylogger. If you are going to use program of this type in Windows make sure where you enter the master password is as secure as possible. Use an anti-keylogger, project the clipboard etc. Good information and free programs will help you with the above are available at the following link. http://freeware.wikia.com/wiki/Lists_of_freeware_antikeyloggers Rapport is recommended by many banks and is the one I use when I view my bank statement details. Note I said view, I never do any transaction in Windows as I consider it too insecure. If you're willing to pay then a review of a number of programs and more useful information is available at the following link:- http://www.toptenreviews.com/software/privacy/best-anti-keylogger-software/ I never use password managers but if I did I would only do it in conjunction with an anti- keylogger. passwordshield.shieldapps.ml --Ip 37.92.173.64 port 53604. Why the software needs to connect to internet each time we start it? Passwords are sensitive datas. Too bad for me. uninstall. I use keypass which is still free since 5 years without problem and the database is portable to the android version which is free too. Staying with keypass. Install with success, but each time the software is started, Malwaresbytes blocks a connection to internet with this message: Connection blocked to a malicious site passwordshield.shieldapps.ml --Ip 37.92.173.64 port 53604. Why the software needs to connect to internet each time we start it? Passwords are sensitive datas. Too bad for me. uninstall. I use keypass which is still free since 5 years without problem and the database is portable to the android version which is free too. Staying with keypass. There is an options to export the database to a CSV. PINs is a free feature-rich Windows program for safe and comfortable storing of any secure information like passwords, accounts, PINs etc. PINs uses a secure 448 bit Blowfish algorithm to ensure the data are not crackable. The password used for securing access to stored data is not saved anywhere. PINs is OSI Certified Open Source Software. It's freeware, but your donations are gladly accepted. Very useful for giveawayoftheday passwords. One Word: Pins PINs is a free feature-rich Windows program for safe and comfortable storing of any secure information like passwords, accounts, PINs etc. PINs uses a secure 448 bit Blowfish algorithm to ensure the data are not crackable. The password used for securing access to stored data is not saved anywhere. PINs does not require installation and does not need any special dlls, drivers or system files which can mess up your system. This means that PINs can run directly from floppy - including data files - without installing anything. This is extremely useful if you wish to easily access your data on other computers as well. PINs is OSI Certified Open Source Software. It's freeware, but your donations are gladly accepted. 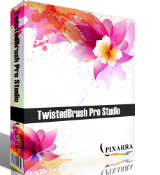 Selected features •Secure 448 bit Blowfish encoding. •Unlimited number of entries and data files. •A clear tree-like data organization which allows logical grouping of systems and accounts. •Automated login into Internet services (SuperPaste). 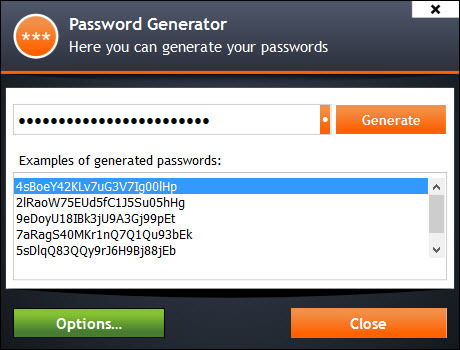 •A powerful random passwords generator. •Safe files wiping using Gutmann, DoD and custom methods. •Embedded hyperlinks launching. •Unlimited in size, multi-line descriptions. •A flexible data import/export in text format. •Multiple user accounts on a single PC. •Accounts sorting using any column as a sort criteria. •Comfortable accounts adding, editing, and deleting. •Compatibility with popular clipboard extenders. •Passwords masking. •Copy logins and passwords to the Windows clipboard. •Find/find next functions. •Expired passwords tracking. •Running from a floppy without saving settings to registry. •Multilingual versions. •Full source code available. •And more... 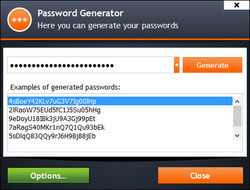 Very useful for giveawayoftheday passwords. What is the URL for this, search brings up too many possibilities. Jim, What is the URL for this, search brings up too many possibilities. Jim, PINs is from 2003. Old school and not worth the effort getting that old 32bit program to run on a modern-day 64bit OS. Bernd, Re "the effort getting that old 32bit program to run on a modern-day 64bit OS." No effort at all. Just download the zip, unzip and run it. Worked fine on a W10 64 Home netbook. Bernd, Re "the effort getting that old 32bit program to run on a modern-day 64bit OS." No effort at all. Just download the zip, unzip and run it. Worked fine on a W10 64 Home netbook. Bernd, most of modern web browsers are 32 bit, like chrome, firefox, opera. Microsoft Visual Studio itself is 32 bit still, though you can produce 64 bit executable with it. There is nothing wrong with 32 bit. Every browser stores passwords so this is a useless program. JEB, Using your browser to store your passwords is one of the most insecure place for passwords. Use Lastpass, Dashlane, Sticky password, 1password, Keypass, anything but your browser to store your passwords. I use Sticky Password, very good program, chose to store in the cloud ( for sync) or on your computer either way one of the better password managers. Keypass is fantastic also. JEB, Using your browser to store your passwords is one of the most insecure place for passwords. Use Lastpass, Dashlane, Sticky password, 1password, Keypass, anything but your browser to store your passwords. I use Sticky Password, very good program, chose to store in the cloud ( for sync) or on your computer either way one of the better password managers. Keypass is fantastic also. Good program. It has no cloud connection. Database is local. I am happy about that. Don't trust cloud. Generates passwords too. Looks rock solid. Should be priced lower or monthly subscription of $1 or less. Also there is no mention of what encryption the program uses. It's local...right...so what happens if your PC crashes and you need to format the disk? Checked , It's local...right...so what happens if your PC crashes and you need to format the disk? That is why you make (or should make) periodic backups of your system. Ideally an image of your drive stored externally, NOT in the cloud. Mario, That is why you make (or should make) periodic backups of your system. Ideally an image of your drive stored externally, NOT in the cloud. "t's local...right...so what happens if your PC crashes and you need to format the disk?" Simple answer you use your backups to restore it ... Assuming you are smart enough to back up your data. Mario, "t's local...right...so what happens if your PC crashes and you need to format the disk?" Simple answer you use your backups to restore it ... Assuming you are smart enough to back up your data. I received the program via the download link but I didn't receive a key! Now it's only a trial version. Any help would be great. Also is this a one off or will it be a subscription after a year? I received the program via the download link but I didn't receive a key! Now it's only a trial version. Any help would be great. Also is this a one off or will it be a subscription after a year? I have been using Dashline. I agree. LastPass is the best I've found. ABMM, I agree. LastPass is the best I've found. bruce, I know Keepass. But I still use LastPass. No hassle. It appears to be nothing more than an encrypted database..
Alternatively why not use a cloud based solution such as lastpass ?? Anything in the cloud can be hacked easier than your (properly secured) PC. PaulW, Anything in the cloud can be hacked easier than your (properly secured) PC. It says the passwords are stored in a centralised location, is that in the cloud, or on the device? If it's the cloud, what happens if the company stops trading? Theresa May, Password Shield stores all passwords in one easy to use program. It means your passwords are stored in the application locally on your hard drive? Theresa May, Is this for hiding your Brexit strategy? You need something "strong and stable"